When we first came to Kumamoto back in July to house hunt, I immediately noticed the colorful covers just outside our center-city hotel. What I didn’t quite get was what the flowers had to do with Kumamoto. Thankfully, a visit to Kumamoto Castle the other day cleared everything up. Apparently, the flowers are Higo camellias, named after the feudal name for Kumamoto prefecture. These gorgeous flowers – which can bloom in red, pink, white, or a mixture of two hues – were originally brought to this corner of Japan from Edo and Kyoto. Once here, they were cultivated exclusively by samurai on their local estates, resulting in a whole new strain of camellia. You can now catch glimpses of camellia in places like Kumamoto Castle and Suizen-ji Garden (a feudal era stroll garden a few tram stops from the castle). The best time for the blooms is between March and early May so plan wisely … and if you’re in the city for a visit, you’d better say hello! I’m curious if these manhole covers are painted/powder coated or if the steel is somewhat impregnated? Nice decorative items for an otherwise crowded street! This manhole is beautiful. The flowers must be awesome when they bloom. 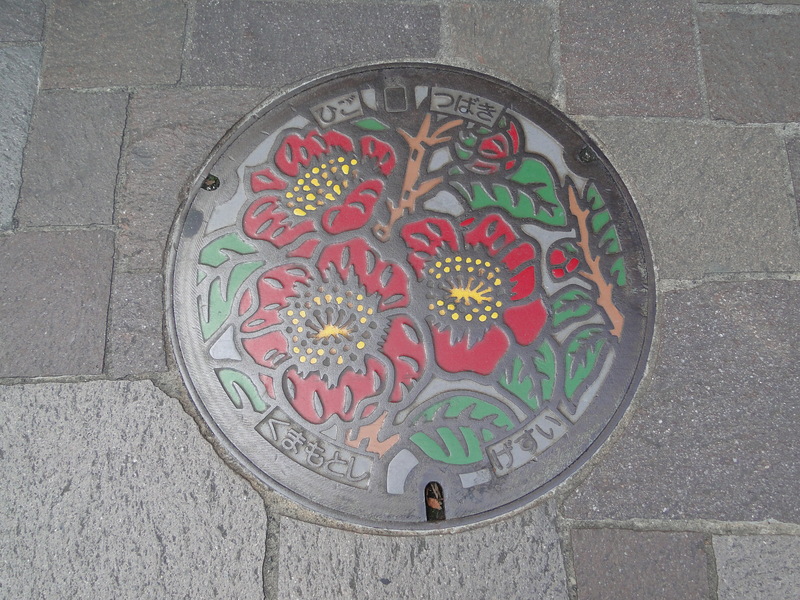 The manhole covers in Japan are beautiful and each area has a unique one. Kumamoto Castle is one castle that I’d love to visit one day.